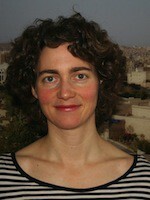 Christine Gerbich has been doctoral fellow in the Topoi research group (C-3) Fragments, ruins and space: the perception and representation of ancient spaces in modern contexts and also in the doctoral program Material Cultures and Object Studies (MaCOS) at the Berlin Graduate School of Ancient Studies since 2012. After completing her studies in Sociology, German Philology and Media- and Communication Sciences at Mannheim University and Indiana University (USA) in 2001, she worked for national and international research projects. From 2009 to 2013 she was responsible for the project “Exhibition Experiment Museology. On curating Islamic Art and Culture” at the Technische Universität Berlin. World Café "On Common Ground: Rethinking (Islamic) Heritage in Europe"